Testing HOT4D. Really quick and dirty test. You can see the repetition on the left top corner, but it’s not really a big deal. Hello, just got hot4d. thanks for making that available. I just switched to C4D from another 3D program. I need water for a project that looks exactly like that–quickly. Does that look require the Physical Sky? 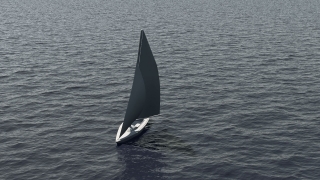 Do you have a tutorial for that specific sailboat project? I’m a 3D veteran, but I just don’t yet understand all of C4D’s lighting options yet. Thanks. i’ve added a link to download the scene file. It was as basic as possible. Physical sky, basic reflection with fresnel. Cloner object. and i placed the camera so you only see the repetition on the left top corner. How do you get the waves to spread out to the horizon like that? I tried using the plugin on a floor object but it just makes the waves flat. Any suggestions owuld be much appreciated! If you look from the boat to the left corner of the picture, you can obviously see the repetition. Use mograph to clone the object. Put the same size on the plan and on hot4D so it will repeat without gap. Great, thank you, will have a go!